I bought it a while ago and opened it a couple of months ago for one of our local group’s tastings—and while no one hated it, it didn’t really ring anyone’s bells either. For that reason, mostly, I’ve been putting off returning to review it despite having listed it in my “Coming Soon…” forecasts for quite some time now. But here I am now. Nose: Very nice stone fruit at first (some peach, light hints of apricot) and some toasted oak. The fruit burns off pretty quickly though and the wood quickly becomes more redolent of pencil shavings. A bit of tart apple too but mostly it’s the wood, promising some astringency on the palate. With more time there’s some vanilla, a touch of cream but it’s tending towards blankness. Water doesn’t improve things. Palate: And mostly it keeps its promise, but there’s more fruit again to go with the wood—apple (sweeter than on the nose) and some gooseberry. The wood is much stronger on the second sip and the balance is quickly lost. With more time the citrus that emerged on the finish starts showing up earlier (lime zest) but it can’t quite keep the wood at bay. Water checks the wood and brings out some more sweetness to go with the citrus but it’s too little, too late. Finish: Medium. Some emerging citrus (lime) but it’s the wood that does most of the talking—more bitter and with some menthol coolness. Water kills the wood but also kills the finish. It blanks out very quickly now. Comments: If not for the astringent wood this would have been a very fresh, aperitif whisky. It’s a little odd that there should be so much sharp wood here though considering it’s from a refill cask. I’m about to send some of this to Florin in a swap—I’m interested to see what he makes of it. 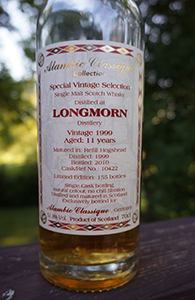 This entry was posted in -Whisky by Rating, 75-79 points, Alambic Classique, Distillery, Longmorn, Whisky by Bottler and tagged *Whisky, Alambic Classique, Longmorn, Scotch, Single Malt, Speyside. Bookmark the permalink. Tnx. I was thinking of buying it, as it is quite cheap, but it doesn’t seem to be good value for money. Rather spend a bit more and buy the Glen Ord. A much better choice I think in a roughly similar genre.